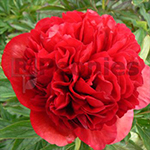 Eliza Lundi is a beautiful dark red and double bomb Peony. It opens in a deep ruby red and grows to a large globular form in the early season. Medium tall, vigorous, makes a wide bush and stands well. The leaflets are dark green and the appearance holds reasonably well as the summer progresses. Eliza Lundi is a perfect Peony for use in pots.